As protests continued unabated over the desecration of the Noble Qur'an by a Greek policeman, Muslim immigrants are calling for bringing the officer to justice for insulting the Muslim holy book. "We want to live here in peace," an Egyptian immigrant, who identified himself as Said told Reuters. "We don't want trouble but we want the policeman to be punished." Hundreds of Muslim immigrants took to the streets of the capital Athens for the second consecutive day to protest the destruction of the Qur'an by a policeman. Chanting "Allah is great", the protestors carried banners reading "Hands off immigrants" and holding up copies of the Noble Qur'an. Clashes erupted between the angry protestors and police, injuring seven immigrants and seven policemen. Police said 46 protesters were arrested. The protestors were outraged by reports that during police checks at a Syrian-owned coffee shop on Wednesday, an officer took a customer's Qur'an, tore it up, threw it on the floor and stomped on it. "Immigrants are outraged," Vasso Akrivou, a member of the group Expel Racism, told Agence France-Presse (AFP). "The incident on Wednesday was the straw that broke the camel's back." 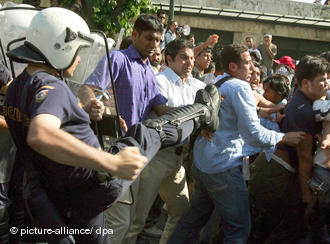 Clashes have erupted between police and predominantly Muslim protesters in Athens, the Greek capital. About 1,000 protesters took to the streets on Friday following reports that a police officer tore up a Quran, the Muslim holy book, belonging to an Iraqi immigrant while checking his identity papers. Greek riot police fired tear gas after scores of the protesters began pelting officers with sticks and stones outside parliament. "They started throwing rocks and sticks at police guarding parliament and the officers responded with tear gas and percussion bombs," a police official said. The protest was the second since the alleged incident. Police said unknown assailants smashed the shop's windows and poured gasoline inside before igniting it. The attack came a day after clashes between more than 1,000 Muslim protesters and Greek police in central Athens, after the police allegedly desecrated a copy of the Koran. The Greek police has opened an investigation into the allegations. Police also used tear gas to disperse protesters who were throwing dustbins and stones on Thursday while a car was damaged during the clashes. Greece is faced with a daily influx of immigrants from Asia via Turkey, many of whom are trying to reach Western Europe. Rights groups have complained of cases of police brutality against immigrants. Interior ministry figures for 2008 show that more than 146,000 illegal immigrants were arrested in Greece, of whom 57,000 had arrived from Turkey. The total number of illegal immigrants living in Greece is estimated to be 250,000, most of them Albanian nationals. Many Muslims in Athens use abandoned factories and converted coffee shops as makeshift prayer houses. Some Muslim groups have complained of police brutality and poor treatment by officials in the past. Athens is the only European capital which does not have a proper mosque or cemetery to serve its Muslim population. There are more than 300,000 Muslims living in Athens, mainly from various parts of northern Africa and Pakistan. At present, the only operating mosques in Greece are in the north-eastern region of Thrace, home to some 100,000 Muslims. Are we allowed to Abuse Servants?